Join us September 21–24 at SIPFilmFest 2017! Women directors have often been neglected by mainstream audiences and canonical academic syllabi. At a time of uncertainty for women's rights, we would like to give voice to female filmmakers, protagonists, and minor characters who have questioned the status quo with their gaze, their stories, and their behaviors, and have gone beyond the traditional portrayal of women as saints or sinners. Our selections of movies 'from the South' encompasses a variety of countries and latitudes to bring women's experiences from a cross-cultural and global point of view to the forefront. SIPFilmFest 2017 is open to the public and all films will be shown in their original languages with English subtitles. How can students participate in SIPFilmFest 2017? La Vendemmia is looking for student journalists to cover the SIP FilmFest 2017! Submit pieces of 250 words or less in Italian, Spanish, or Portuguese to the editor. Get your Passport to SIP FilmFest 2017 stamped with each movie you watch. If you watch at least three movies, you'll have a chance to win great prizes! Keep an eye out for the raffle box at the last three showings. Update: congratulations to the student winners! Click to download the SIPFilmFest2017 poster! All are invited for the Opening Reception on Thursday 9/21 at 7pm in Minor hall Lobby. The longtime housekeeper for a wealthy São Paulo family, Val is committed to loyalty and respect. But her values, and the dynamic of the whole household, are challenged when her teenage daughter visits in this astute, socially conscious comedy. Q&A with Mabel Richart Marsé, Ph.D. Visiting Professor at the Spanish, Italian and Portuguese Department follows film. Rosa is a prostitute who inherited the profession from her mother, Antonia. Antonia now believes she is the famous actress and singer Sara Montiel, making Rosa’s life extremely difficult. Rosa does not know how to be happy, or something keeps her from achieving happiness. The arrival of an unexpected new member to her absurd and awkward family will provide her with a new opportunity to give happiness another chance. and Director of the UVA-Guatemala Initiative follows film. On the slopes of an active volcano in Guatemala, a marriage is arranged for seventeen-year-old María by her Kaqchikel parents. But María wants to migrate to the United States. Rome, 1984. Aria is a nine-year-old girl. On the verge of divorce, Aria's infantile and selfish parents are too preoccupied with their careers and extra-marital affairs to properly tend to any of Aria's needs. While her two older sisters are pampered, Aria is treated with cold indifference. Yet she yearns to love and to be loved. This animated film is a free adaptation of Shakespeare’s A Midsummer Night’s Dream. According to legend, on the night of Saint John (the Summer Solstice), humans can reach the world of fairies and elves, where all dreams come true. Theseus, father of Elena and Grand Duke, is ill. Even though Elena does not believe in fairies she goes in search of Titania, the queen of all fairies, the only one that can help her father. 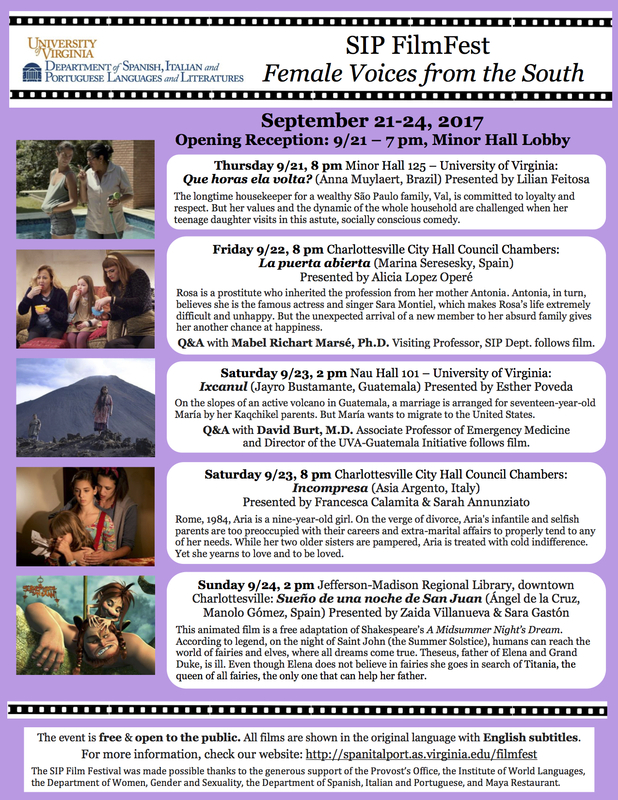 SIPFilmFest 2017 is possible thanks to the generous support of the Provost’s Office; the Institute of World Languages; the Department of Women, Gender & Sexuality; and the Department of Spanish, Italian and Portuguese. The event was organized by Sarah Annunziato, Nuria Ballesteros Soria, Francesca Calamita, Marina Escamez Ballesta, Lilian Feitosa, Sara Gastón Echevarría, Esperanza Gorriz Jarque, Alicia López-Operé, Esther Poveda Moreno, Paula Sprague, and Zaida Villanueva García.